The most important part of any trading strategy is determining the specific style of risk management you plan on evoking. Before you actually enter a trade, you always need to have a firm idea of where you plan on exiting and admitting you are wrong. What is much harder to do is determining when you are right without leaving money on the table. This is where a trailing stop loss can come into play. Not every trading strategy is geared toward using a profit point that is a moving target. For example, if you plan on scalping the market, you cannot afford to risk removing a profit level, and hope the market continue to move your way. The same can be said for a mean verting strategy with a currency pair or index that trades in a relatively tight range. A trailing stop is best geared for a trend following strategy that uses momentum to capture a move. In general, trend following strategies are geared toward capturing large moves when a market is beginning to trend. One of the problems with a trend following strategy is that determining when a trend is in place usually requires a signal that lags, at the trend needs to begin for you to realize that there is a trend. One of the most commonly used trend following strategies is the moving average crossover strategy. This strategy waits for a short term moving average to cross above or below a long term moving average. The chart of the USD/JPY shows 4-specific scenarios when the 20-day moving average crosses either above or below the 50-day moving average. The issue with this type of strategy is that the signal is late many times, and if a trend is not in place you experience a loss. Since markets generally trend only about a third of the time, you have to make more on your winning trades than you lose on your losing trades for this type of strategy to make financial sense. The key to a successful trend following strategy is to ride the trend until to turns around. The best way to do this is to evoke a trailing stop. A trailing stop is a stop loss that continues to move with the market. As the trend takes hold and the market moves in your direction you continue to move your stop with the market. So instead of creating a trading strategy where you plan to make $2 for every $1 that you risk. You set your initial stop loss, and then move it with the market as it changes. Many traders will wait for a reverse signal to help the determine that the market has changed trends. 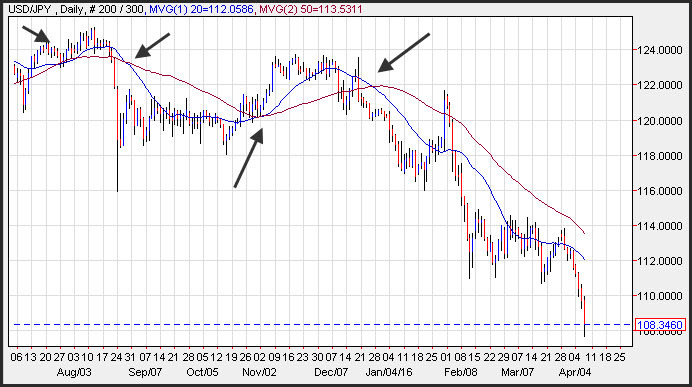 Other will use a shorter term moving average cross over to help them determine that the market has changed direction. Using a trailing stop loss with a trend following strategy will keep you in the market as it moves your way and allow you to reap substantial gains which will make up for the losses you experience when the security you are trading is range-bound.